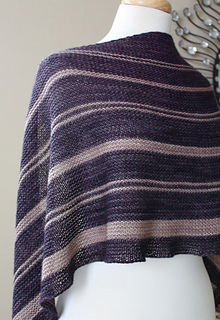 This crescent-shaped garter stitch shawl is worked from the top down with increase stitches on every row. 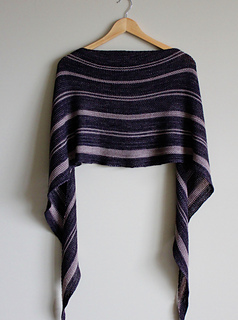 It makes for an easy knitting project that is kept interesting with frequent colour changes to create contrasting stripes. After making one you will want to make another. And the best part? It makes a great gift. Just ask my mom! 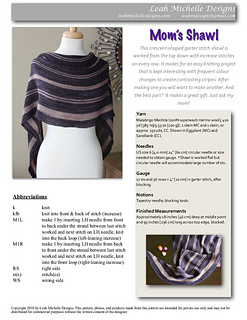 Pattern includes list of abbreviations, diagram, and written instructions. 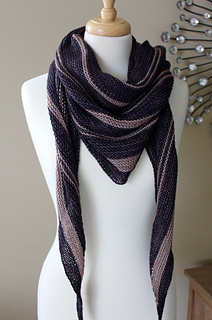 This pattern uses two colours of Malabrigo Mechita. 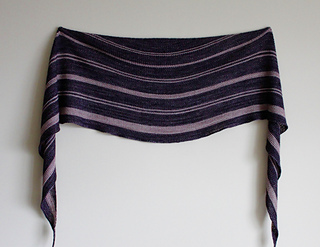 It is shown here in Eggplant (MC) and Sandbank (CC). 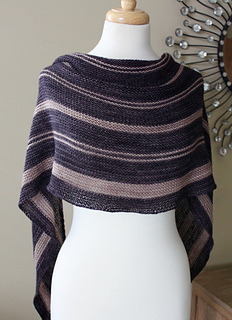 One whole skein (420 yds) of Eggplant was used and approximately 150 yds of Sandbank was used. Finished measurements: Approximately 18 inches (46 cm) deep at middle point and 93 inches (236 cm) long across top edge, blocked. Skills required: increasing, changing colours, blocking. Stitches used: k, kfb, M1L, M1R. 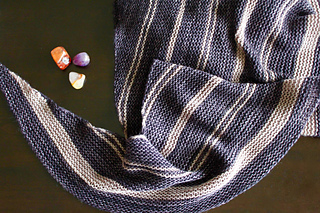 For tips on changing colours, see Changing Colours When Knitting Stripes 101.